Visit the Holy Land - The Holy Land. Real places. Real events. When you visit the Holy Land you experience a sense of place for your Christian faith. You come face-to-face with real stories from the Bible that happened in a real place in real time. Join us February 11-21, 2019 visiting sites like Caesarea, Mount Carmel, Nazareth, Capernaum, Magdala, Jerusalem, Gethsemane, Bethlehem, and Petra in Jordan — places where the Scriptures come alive! 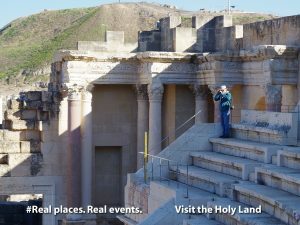 Hosted by Dr. Ian Adnams the tour will encourage your faith and enhance your understanding of biblical times, customs, and places. or call Nataliya at Indus Travels toll free 1 866 978 2997 ext 828. Jesus revealed through His Word, His life, His land and His culture. Tour Registration or call Keren Samuel at Indus Travel 1 866 978 2997 ext 806. Items of a personal nature such as laundry, telephone calls, mini-bar etc. Lutheran women are gathering from across Canada to experience the Holy Land together October 23-31, 2016. Registration deadline extended to July 29. Call Keren @ Indus Travels for last-minute information: 1-866-978-2997 ext. 806. 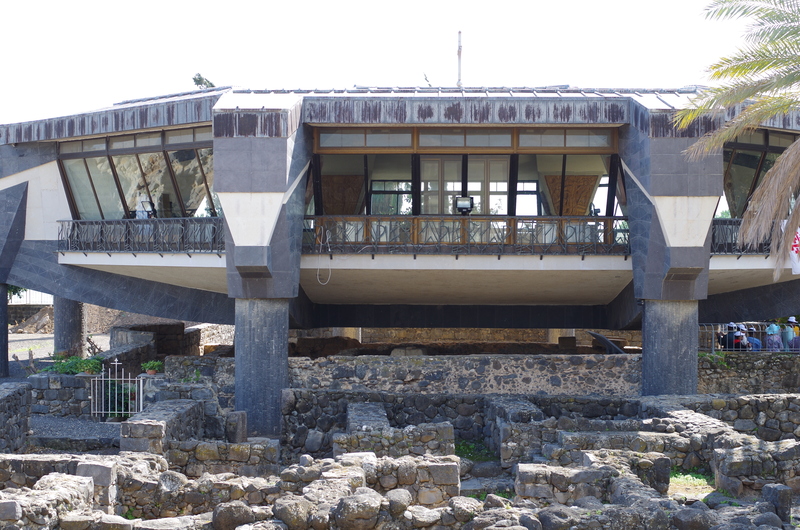 The synagogue in Capernaum where Jesus taught. 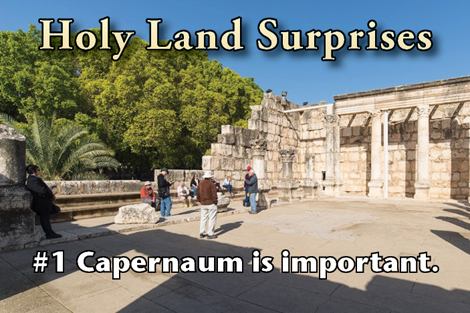 “Capernaum was central to Jesus’ Galilean ministry,” noted Pastor Jim Fritsche who was on the Epiphany 2015 tour. Within walking distance of this town on the shores of Galilee you have the location of the Sermon on the Mount, the miracle of the multiplication of loaves and fish, the healing of many people, the teaching in the synagogue, the calming of the sea, Jesus walking on the water and Jesus meetings His disciples after His resurrection. So many events in and around Capernaum. Since it is considered Jesus’ home base, it is part of every Holy Land itinerary. The Church of St. Peter’s House is built over a site believed to be the home of Peter and his family around which an octagonal church was built in the 4th century. Quietly, without drawing attention from their sacred charges, the men in brown robes mingle with tourists and pilgrims alike. For more than seven centuries, the Franciscans, on behalf of Christians of all traditions have kept watch over 50 sites in the Holy Land – 90 percent of the identified Holy places. 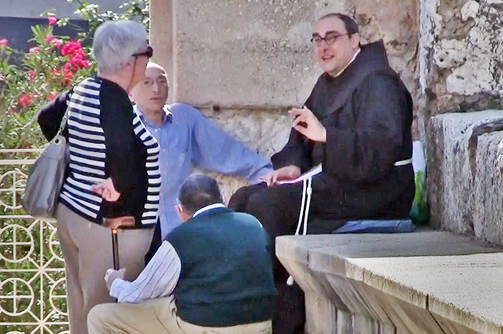 A Franciscan brother talks to pilgrims in Capernaum’s Synagogue. Although the order can date its presence in the area back to 1217, the Franciscans received their charge for overseeing the holy sites in 1342 from Pope Clement VI. The Papal Bull details how the King and Queen of Sicily negotiated with the Sultan of Babylon, who occupied the land at the time, to allow for the “Divine Liturgy” and “Solemn Sung Mass” at the Church of the Holy Sepulchre in Jerusalem. The Pope gave this responsibility to the Franciscans who were already living in the city. As new sites were identified, the Franciscan’s role increased. But the Roman Catholic Church is not the only Christian entity in the Holy Land nor does it have sole claim to many sites. The Eastern Orthodox and Armenian Orthodox Churches are also highly visible in the Holy Land. The three share a historical presence at the Church of the Holy Sepulchre in Jerusalem and Church of the Nativity in Bethlehem. The arrangements are not without friction. 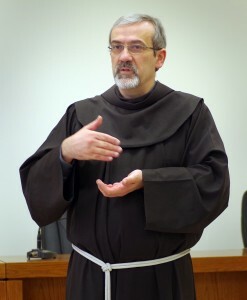 Father Batista noted that few disputes arise from theological issues, but usually around maintenance of the sites which are part of the ongoing exercise of “life together” as they seek resolutions. Ancient animosities are evident in Jerusalem for example. A dispute over when the Church of the Holy Sepulchre would be open resulted in the keys being held by a Muslim family who would act impartially. More recently, discussions over much-needed repair to the Church of the Nativity in Bethlehem, which also included the Palestinian Authority, resulted in the church building becoming a World Heritage Site under the umbrella of the United Nations. Currently, repairs to the roof are in progress and other preservation measures are planned. Of course, few who travel from around the world to visit the sites are aware of the background tensions. What they experience are layers of history – literally. Many of the sites – both sacred and secular –reflect the area’s cycles of conquest, destruction, and rebuilding. It’s easy to see former entrances bricked up, different architectural styles next to each other, and newer walls on old foundations. Ask one of the Franciscan brothers about the history and he will provide all the details. But the Franciscan presence is not solely focused on preserving and interpreting the past. The order is also concerned about the present and future. One of the challenges of the Holy Land is serving the small Christian minority, mostly Arab, and a growing number of Roman Catholic believers from the Philippines, India and Africa who work in Israel. Franciscans hold Mass, operate schools and support the poor as they do around the world. They are also aware of the political reality in which they carry out their work and seek supportive relationships with both Israelis and Palestinians. Interacting with visitors encountering the physical evidence of their faith is the Franciscan’s prime activity in the Holy Land. Father Batista noted a change in the types of visitors they meet. He estimates that 90 percent are what he calls “religious tourists” while the remaining 10 percent are “pilgrims” – people looking for a deep spiritual experience. An increasing number arrive in Israel from Brazil, Russia and Africa. In one of the later scenes of the award-winning film “Lincoln” the American president and his wife are seen riding in a carriage discussing their relationship and their dreams for the future. At one point, Lincoln looks off into the distance and muses about visiting the Holy Land and walking in the footsteps of David and Solomon. Walk the path leading to Capernaum on the shores of Galilee. Those sentiments, expressed in the late 19th century, have echoed in hearts and minds of Christians for almost two millennia. There is a deep, spiritual longing to “walk where Jesus walked” and place the words of the Bible into a geographical context. To help trace those footsteps, the Israeli Government established The Gospel Trail, a 62 km-long hiking or biking route from Nazareth to Capernaum on the Sea of Galilee. Broken into four stages, the route features 25 significant sites in the life of our Lord. As one would expect, the trail begins in Nazareth, home of Mary, Joseph and Jesus. Archeologists estimate its population at the time of Jesus at less than 500. Today it is a busy city, predominantly Muslim Arab-Israeli with a population of about 65,000. 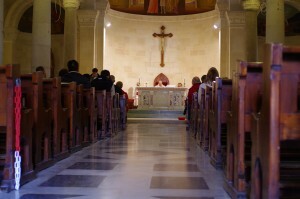 Mass in the Church of St. Joseph. Tour buses navigate its narrow streets delivering pilgrims and tourists from around the world to the beautiful Basilica of the Annunciation. Tradition says the church is built over the house of Mary, and an adjacent smaller, older church near the house of Joseph. Built in 1969, the basilica is a modern version of two previous churches on the same site built in the Byzantine and Crusader eras. The architect, Giovanni Muzio created a unique space that incorporates the traditional site of the Annunciation. A large portion of the floor in front of the altar is cut away to expose an ancient grotto below said to be where the Angel Gabriel greeted Mary. Lining the basilica’s walls are large pieces of artwork portraying the Virgin Mary donated from around the world, including Canada. A portico surrounding the building features additional international interpretations. This internationality is reflected in the visitors to all the Holy sites. It’s not unusual to encounter a group of African Christians spontaneously breaking into song, swaying as they sing their rhythmic hymns. Israeli tour guides, all government-trained, speak multiple languages providing the biblical, historical and cultural context for their international guests. Travelling from Nazareth to the Galilee is to experience a changing landscape. The stark hills and rocks of Jesus’ home town slowly give way to rolling hills and lush vegetation (depending on the time of year) as you descend into the Plain of Gennasaret surrounding the Sea of Galilee (Kinneret). Churches throughout the area bear witness to the Sermon on the Mount, feeding of the 5000, and Jesus’ post-resurrection meeting with Peter. The Church of St. Peter’s House is built over an ancient church built to preserve St. Peter’s house. 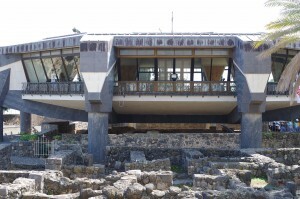 Of special interest is Capernaum – “The Home of Jesus.” Most of its ruins date back to the time of Jesus. Remnants of walls outline what was once a compact town. The foundation of the large synagogue is original to Jesus’ time and excavations have revealed what is believed to be the house of St. Peter. Like the Basilica of the Annunciation, the Church of St. Peter’s House is built over the ruins and a glass floor allows visitors to view the site from above. Current archeological digs along The Gospel Trail include Migdala/Magdala, home of Mary Magdalene. It’s not too far from Capernaum and on one of the routes to Jerusalem. 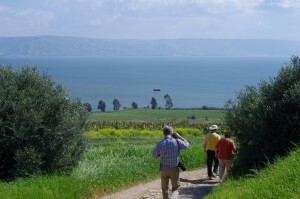 A highlight for visitors is sailing on the Sea of Galilee. Once away from the shore, you can appreciate the landscape and pick out the various churches built to commemorate and remember key events in the life of Jesus. Two of my own trips on Galilee have been on calm waters, but on my most recent visit, we had to take a different route because of rough waters. Strong winds still create stormy seas just as in Jesus’ time! Touring through this region of the Holy Land provides insight into so many parables and Gospel stories. You see the rocky soil and good soil mentioned in the Parable of the Sower; imagine thousands sitting in a natural amphitheatre listening to Jesus; experience the dust that required foot washing; measure the distance from Capernaum’s synagogue where Jesus spoke then went to heal Peter’s mother-in-law. The Galilee experience seeps into your soul enriching your faith and empowering you to continue walking the walk. Imagine a visit to the Holy Land! Imagine visiting the Holy Land! For many it’s a dream or on a “to do” list. But the pilgrimage of a lifetime is yours to experience with Adnams Group. Working with experienced tour operators we organize tours to The Holy Land and other biblical areas. Dr. Ian Adnams, former director of communications for Lutheran Church–Canada plans itineraries that not only include many of the Biblical sites in The Holy Land, but through his network of contacts can include areas of interest to a variety of groups. If you would like more information on visiting The Holy Land, please send us an email. © 2019 Visit the Holy Land.